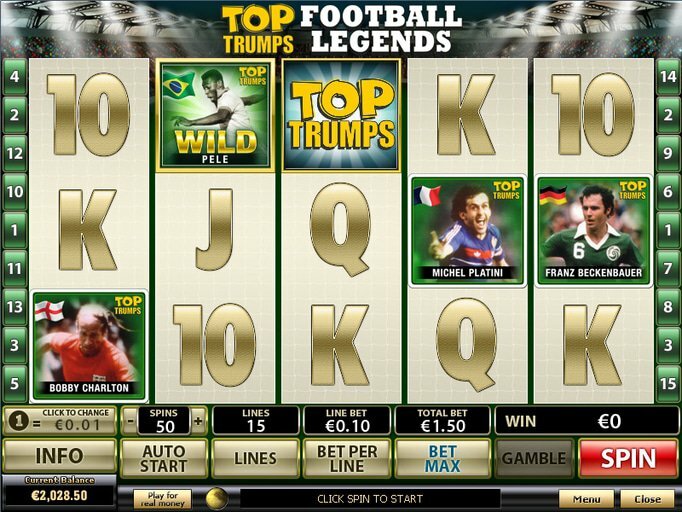 The Football Legends slot machine features some of the most prominent names in soccer history. It features a stadium background and a green and silver theme complete with legends like Michel Platini, Bobby Charlton, Franz Beckenbauer and others. There are five reels and 15 paylines, a top jackpot of 10,000 coins, and coin denominations starting at just a penny and climbing up to $5 - that means that the top jackpot is $50,000! If you happen to see the Wall of Fame symbol on the first and last reels simultaneously, this will take you to the second screen bonus round where you'll see the pictures of 16 famous soccer players which can be reshuffled before you start. Then, you'll pick three of these for an instant cash prize or an extra pick. Remember that the reshuffle option is no longer available to you once you've chosen your first card. As far as the scatter goes, this is the Top Trump icon and it will pay out according to the pay table and award you with 10 free spins all at the same time. As these progress, you'll actually get to choose which star you'd like to act as your wild, and if this star actually helps you create a winning combination, that amount will be quadrupled. Remember that you can't trigger the bonus game during this feature but you can retrigger the free spins. During regular spins, Pele acts as your standard wild but cannot take the place of the bonus or the scatter icon. This title also has a Gamble feature which is completely optional. After each winning spin, you'll be asked if you'd like your chance to Double, Double Half, or Collect. If you double, you're staking all of your winnings on your ability to accurately guess the color of a card. If you double half, you'll only stake half of your winnings. Finally, if you choose to collect, you can bypass this option entirely. You can collect some Football Legends free spins over at Bet365 without any kind of risk or deposit necessary. Then, if you decide you like what you see, you can grab a welcome offer that is a 100% deposit match worth as much as $200 when you enter the code BONUS100 at checkout.